A snake stuck to a glue trap brought to TWRC Wildlife Center. Even though snakes may not be your favorite animal, remember that they are the natural predator of mice and rats so in an attempt to catch a mouse, this homeowner caught the snake that may have eliminated the mouse. Unwanted guests like rats and mice are not always a sign of poor housekeeping but rather a fact of life. There are several things on the market that are used to bait and catch the unwanted guests such as mousetraps, rat poisons and glue traps. Of these options, the most inhumane of all of them is the glue trap. Glue traps are made of a piece of cardboard, fiberboard or plastic that has been covered with an adhesive. Sometimes the adhesive has been treated to smell like food so the animal is attracted to it. Once the animal steps on the trap, it is unable to get free. The animal then dies of starvation, dehydration or pure exhaustion. It can take several days for the animal to die. It is a slow, agonizing death. Many are calling for glue traps to be outlawed and petitions have been started and signed by thousands. A very common problem with glue boards is that often times innocent victims get stuck. TWRC Wildlife Center has had its share of panicked homeowner calls asking for help in freeing pets, birds, squirrels, lizards, and snakes. We recommend that no attempt be made to free the animal by untrained hands and that they bring it to the wildlife center for assistance. If it’s a recent incident, we are often times able to free the animal and give it medical attention to try to save it. More often than not, however, the animal can’t be saved and it will be euthanized to end its suffering. Glue traps, like most traps, are a temporary fix. The best way to eliminate the problem of unwanted guests is to eliminate any food source that may be attracting them and to repair cracks and holes where they may be entering your home or place of business. TWRC Wildlife Center is a 501(c)(3) organization that rehabilitates injured and orphaned wildlife with the goal of returning healthy animals back to the wild. 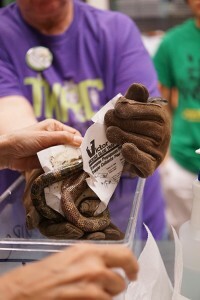 For more information go to www.twrcwildlifecenter.org.